One of the books I have received for reviewing recently is Alan Connor’s Two Girls, One on Each Knee (7) which is, as you may have gathered, a book about crosswords. It is very interesting from what I’ve read so far, and includes interesting facts as well as instructions on how to do them. OK, here’s where it gets relevant to computing. At the beginning of the books is a table of contents, right? So far, so ordinary. However, this is in the form of a crossword puzzle, as illustrated below. 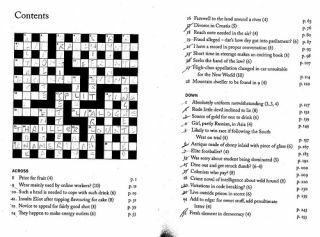 So you have this self-referential situation in which you don’t know which chapters to look at to help you solve cryptic crosswords, until you have solved the cryptic crossword that is the table of contents! I think this is great fun, and it started me thinking: would it be possible to devise a teaching resource about coding, say, which the pupils couldn’t access until they had learnt a bit of coding? Some years ago I devised a spreadsheet in which the pupils had to solve a series of problems that would, eventually, lead to the revealing of the name of the best teacher in the school. Well, I can see that you’re ahead of me: the solution was, of course, “Mr Freedman”! Looking back, although that gave us all a good laugh, maybe I should have had the spreadsheet puzzle lead to terminology like “IF function”, say. If you were to devise a program about programming in the self-referential way I’ve suggested, you’d almost certainly have to have additional resources such as built-in Help buttons, useful websites or printed materials. You’d also have to pair pupils up in useful ways (ie useful to both parties) – which, of course, you ought to be doing anyway. Even if my suggestion proves too difficult to fully realise, just attempting it could be a good learning experience. For this reason I’d recommend getting your pupils to try and come up with something. Creating a game has been shown to be beneficial for learning, so I see no reason that the same should not be true of creating a puzzle of some kind. Even younger pupils could have a go, perhaps devising clues for a wordsearch on a particular theme. A nice tool to try is the Discovery Education Puzzles website, on which you can create several different types of puzzle. For me, creating a self-referential resource like this, especially if pupils were actively involved, would not only potentially be hugely enlightening. It would also be fun. BETT is, of course, the annual ed tech show in the UK. The two girls are PAT and ELLA, ie PATELLA, which we have on each knee!